A profile into Womens BBall players that ended the season strong. Nicole Cardaño-Hillary finished this season with a Field Goal percentage of 34.7, 68 3-pointers made, 137 free throws made, 605 total points, averaged 17.8 points per game, grabbed 113 rebounds, dished out 102 assists, and had 84 steals. She has a great basketball IQ and can read defenses well; I cannot wait to see how her “MJ” style and play-making ability progresses as she goes through this program. Jacy Bolton finished this season with a Field Goal percentage of 43.5, 36 3-pointers made, 47 free throws made, 305 total points, grabbed 142 rebounds, dished out 72 assists, and had 39 steals. She now sits 20th all-time in school history with Cardaño-Hillary with 68 3-pointers made and still has a bright 2 years ahead of her; I’m definitely excited to see her play. Sarah Kaminski finished this season with a Field Goal percentage of 36.2, 52 3-pointers made, 21 free throws made, 215 total points, grabbed 96 rebounds, dished out 76 assists, and had 22 steals. She now sits 16th all-time in school history with 83 3-pointers made passing Amber Easter, Director of Operations for Mason WBB. I guarantee that she’ll still be lethal from behind the arch next year. Tayler Dodson finished this season with a Field Goal percentage of 36.6, 6 3-pointers made, 55 free throws made, 181 total points, grabbed 187 rebounds, dished out 110 assists, and had 23 steals. Dodson, a true senior, finished her career at Mason with the school record for games played with 124, had 112 career starts, a total of 469 points, holds 22nd place all-time in school history in rebounds with 455 and holds 12th place all-time in school history with 251 assists. She passes the ball well, a characteristic that is often overlooked in basketball. It’s sad to see her go, but she was a great asset to this team. Camarie Gatling finished this season with a Field Goal percentage of 50.8, 22 free throws made, 144 total points, grabbed 101 rebounds, dished out 12 assists, and had 10 steals. She had a good amount of points for the minutes that she played, I can not wait to see her play next season. Marika Korpinen “Finnished” (sorry, I had to) this season with a Field Goal percentage of 30.1, 13 3-pointers made, 12 free throws made, 81 total points, grabbed 46 rebounds, dished out 39 assists, and had 15 steals. These are good numbers for her size and the amount of playing time she has. I can not wait to see how she develops in this program. 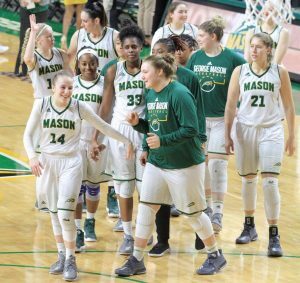 Congrats on the great season, Mason WBB! Best of luck as you prepare for the next one! Stay tuned for a Breakdown of Natalie Butler’s season on WGMU Sports.